Quintus Salvidienus Rufus was a Roman general and one of the closest advisors of Octavian during the early years of his political activity. He struck coins in 40 BC in the name of Julius Caesar, in conjunction with Octavian. In 42 BC he commanded the fleet of Octavian against Sextus Pompeius, who had taken control of Sicily and was harassing the coasts of Italy. However, Salvidienus was defeated in a naval battle fought off Rhegium, largely because of the inexperience of his crews. On Octavian's return from Greece after the Battle of Philippi, Salvidienus was sent to Spain with six legions, but he hastily retreated to Italy to oppose Lucius Antonius and Fulvia (Antony's wife), who had taken up arms against Octavian, starting the so-called Perusian War. Salvidienus captured and destroyed the city of Sentinum and then, with Agrippa, surrounded Lucius Antonius's forces in Perusia. The other Antonine generals, who had no clear orders from Antony, remained out of the struggle and Lucius Antonius was forced to surrender after a few months of siege (Winter 40 BC). 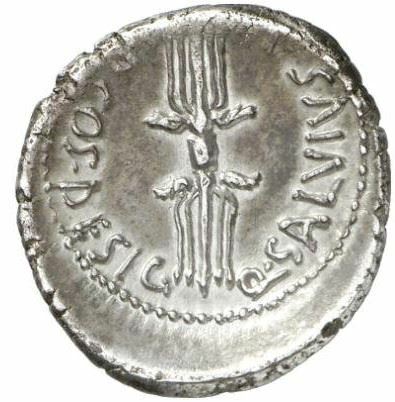 After the end of the Perusian War Octavian sent Salvidienus to Gallia as a governor, with a large army of eleven legions. Despite all these honours, when Antony came from the East with large forces to confront Octavian, Salvidienus offered to desert to Antony with his legions. Antony revealed to Octavian the treachery of Salvidienus, who was accused of high treason in the senate and condemned to death in the Fall 40 BC. He was either executed or committed suicide.